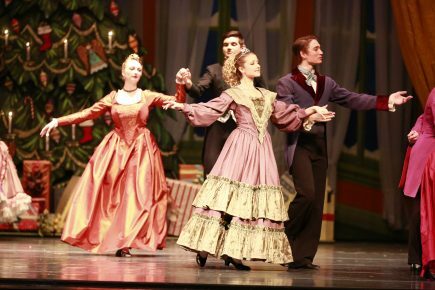 BUTLERBALLET’s 2016-2017 season begins December 1-4 with the holiday classic The Nutcracker in Clowes Memorial Hall. Tickets start at $24.50. They are on sale through Ticketmaster, the Clowes Hall box office, 317-940-6444, and butlerartscenter.org. Following The Nutcracker will be the annual Midwinter Dance Festival, featuring two different programs on alternating days (February 8-12) and Giselle (April 21-23). More about each event follows. The grand holiday tradition continues as ButlerBallet proudly presents the only fully staged production of Tchaikovsky’s The Nutcracker in central Indiana. Be dazzled and delighted by spectacular dancing, beautiful costumes, glorious scenery, and pyrotechnical magic as the brilliance of Tchaikovsky’s music is brought to life by the Butler Ballet Orchestra and the Indianapolis Children’s Choir under the direction of Richard Auldon Clark. This bold combination of classical ballet and modern dance includes two exciting programs in repertory featuring works by resident choreographers Marek Cholewa, Stephan Laurent, Susan McGuire, Cynthia Pratt, and Derek Reid. To condemn feeling is a madness; to try to repress it is even greater madness. Embrace your true romantic side and join the ButlerBallet in their presentation of Giselle, the story of a simple peasant girl who is betrayed by love, driven to madness, dies of a broken heart, becomes a ghostly spirit, and eventually saves the life of the man that betrayed her. The beautiful score composed in 1841 at the height of the Romantic era by the brilliant Adolphe Adam will be performed live by the Butler Symphony Orchestra under the direction of Maestro Richard Auldon Clark.